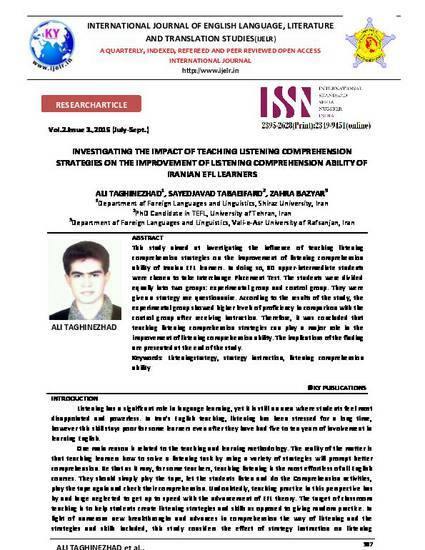 This study aimed at investigating the influence of teaching listening comprehension strategies on the improvement of listening comprehension ability of Iranian EFL learners. In doing so, 80 upper-intermediate students were chosen to take Interchange Placement Test. The students were divided equally into two groups: experimental group and control group. They were given a strategy use questionnaire. According to the results of the study, the experimental group showed higher levels of proficiency in comparison with the control group after receiving instruction. Therefore, it was concluded that teaching listening comprehension strategies can play a major role in the improvement of listening comprehension ability. The implications of the finding are presented at the end of the study.